The AMS Performance/Moroso Wet Sump Oil Pan is designed to keep oil where it needs to be even in the most severe racing scenarios. Stock oil pans do not take into account the effects that sustained high speed turns or acceleration can have on the oil. During these situations oil can be pushed to one side of the pan causing vital engine components to be starved of oil. 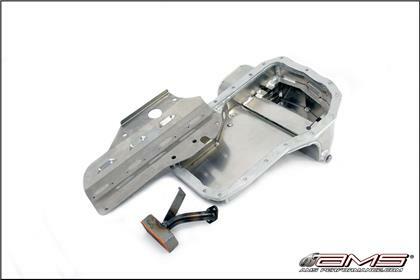 The AMS Performance/Moroso Wet Sump Oil Pan will not only accommodate another 1.5 quarts of oil but by using a trap and kick outs, it enables oil to stay where it is needed. The added capacity and aluminum construction have the added benefit of keeping the oil cooler. The AMS Performance/Moroso Wet Sump Oil Pan is a must for every type of racing.